Rediff.com » Business » Complain about getting Shanghaied, not Bangalored! Complain about getting Shanghaied, not Bangalored! American jobs are being lost because of outsourcing, to places like Bangalore. So, unlike many other visiting dignitaries, President Obama is going to give that city a careful miss during his three-day Indian sojourn. That stands to reason, given that he has already announced visa restrictions that will affect India's software giants, and tax changes to prevent the "exporting of American jobs", as Lou Dobbs says it. 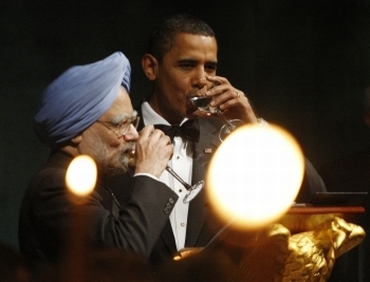 Image: Prime Minister Manmohan Singh with US President Barack Obama. President Obama is, therefore, coming to India with the economic agenda as his main focus; and at the core of that is the promise to open up the Indian market in order to create more jobs for Americans. The message from Washington, a week before Mr Obama arrives, is that the trip is oriented to addressing the audience back home, where unemployment features as a major issue. 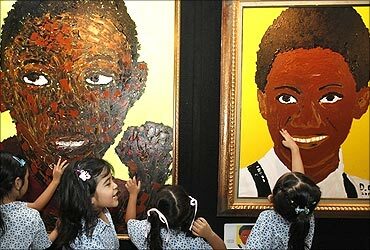 Image: Students gather next to paintings of US President Barack Obama. This is entirely understandable, indeed to be expected, because Mr Obama will be coming to India just after mid-term Congressional elections have led to a rout for his party, and he will want to be seen as delivering on job creation. As is often the case, diplomacy is simply domestic politics by other means. Still, it is helpful to juxtapose the focus on "opening up the Indian market for American jobs" with the facts of the case. At a White House briefing a couple of days ago, reporters were told that American goods exports to India have quadrupled in the last seven years, while service exports have trebled. 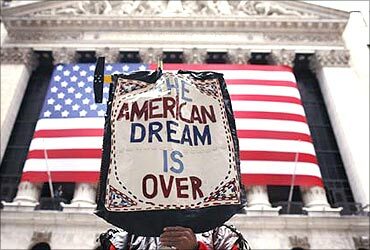 Image: America needs to create more jobs. Overall, American exports of goods and services have grown in these seven years from $7 billion to $27 billion. In other words, American exports to India are no longer "as flat as a chapatti" - as the then US Ambassador Robert Blackwill declared early this decade. Further, reporters were told, "the trade relationship is broadly balanced, including goods and services." And that's not all. 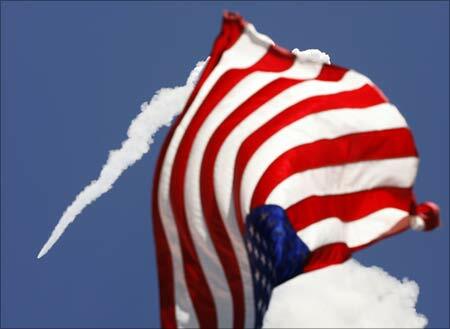 Indian companies are now the "second-fastest-growing investors in the United States". And they now support about 57,000 jobs in the US. Image: Barack Obama volunteers to paint at National Day of Service and Remembrance event in Washington. So, bilateral trade is balanced, American exports are growing rapidly, and Indian companies are busy investing in the US and creating jobs there. This is a far cry from the case with China, which has a massive trade surplus with the US, and keeps its currency artificially low - whereas the rupee has gained nearly 10 per cent against the dollar this year. Why then would any American president complain about being "Bangalored"? He should, instead, be talking of getting "Shanghaied". 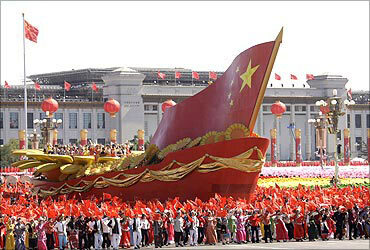 Image: A parade in China. Sensing the disconnect, reporters asked US officials whether Mr Obama would be raising the issue of outsourcing, about American jobs being lost. Sample this question, printed verbatim: "There are reports that there are $12 billion worth of orders are being (inaudible) for the US. This includes $5 billion for the defence and another $7 billion of commercial deals like the Boeing aircraft, which will create 50,000 to 60,000 jobs in the US alone. How do you think it is justified to level allegations like jobs are being outsourced to India?" The response was a neat dodge, to not answer the question. 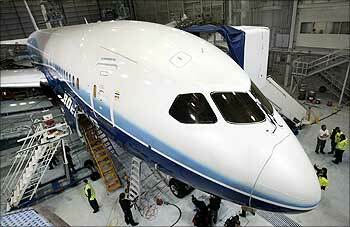 Image: The Boeing company's first 787 Dreamliner is readied for its first test flight. So, here's a suggestion to the Indian businessmen who will meet Mr Obama in Mumbai next Saturday: By all means shower the visiting dignitary with effusive words of praise, because you do go overboard on these occasions. But don't let the occasion pass without pointing out that Indo-US trade is balanced, that American exports to India are growing rapidly, and that Indian companies are creating jobs in the US; and then asking whether Mr Obama really has any concern about Indian companies stealing American jobs - because the facts don't stand up. As N R Narayana Murthy advised a few days ago, there is no need to be apologetic about outsourcing. 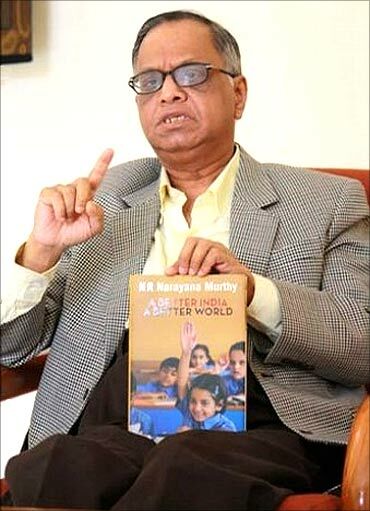 Image: Infosys mentor Narayana Murthy.